Panasonic has announced two new High Definition 3CCD camcorders, the HDC-SD5 and HDC-SX5. The Panasonic HDC-SD5 is the world's smallest and lightest 3CCD High Definition camcorder, and records on SDHC/SD memory cards while the HDC-SX5 can record on both SDHC cards and DVD discs. Both new Panasonic camcorders can record full-HD video at 1920x1080 pixels resolution, using 3 imaging chips, and incorporate the latest enhanced version of Panasonic's Advanced OIS (Optical Image Stabilizer) system. 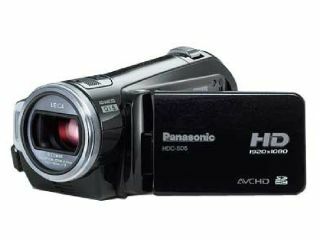 Both models use the AVCHD high definition recording format and feature an improved version of Panasonic's Crystal Engine image processor to improve image quality. Panasonic has given its two new HD-camcorders a new 'Pre-Record' function, which enables users to capture the first three seconds before they start shooting, thanks to a buffer recording function. The Pre-Record function can automatically buffer 3 seconds of footage continuously, and when the record button is pressed the 3 seconds of pre-shot footage is added to the beginning. Other key features of the Panasonic HDC-SD5 and HDC-SX5 include: high quality Leica Dicomar Lens systems; Intelligent Contrast Control to dynamically adjust contrast levels as ambient lighting conditions change; a Wide Viewing Angle LCD monitor using a 300k-pixel display with a 170 degrees viewing angle horizontally and vertically; and a Power LCD Extra function to adjust the LCD brightness automatically in different lighting conditions. The two camcorders also offer improved video archiving and playback options. The SD5 can record to a new Panasonic DVD burner at the touch of a button using a USB Host function, while the SX5 can copy internally from its SDHC memory card to the DVD without having to use a PC.